Deputy Administrator Pete Gaynor will become acting administrator, according to the Homeland Security Department, of which FEMA is a part. In December, Rep. Elijah Cummings, then ranking member and now chairman of the House Oversight and Reform Committee, sent Long a letter demanding compliance with the committee’s previous requests for documents pertaining to the emergency response in Puerto Rico and the U.S. Virgin Islands following Hurricanes Irma and Maria, which resulted in thousands of deaths. 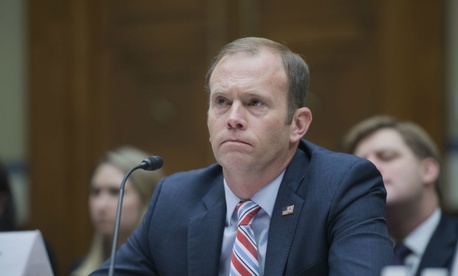 Long’s departure comes as FEMA regains its footing following the 35-day partial government shutdown, which set back preparedness activities and planning just three months ahead of the 2019 hurricane season. An employee who works in FEMA’s resilience office told Government Executive the agency was unable to conduct exercises or planning for hurricane season or process grants to help state and local governments prevent terrorist attacks during the shutdown. Long’s tenure at FEMA was controversial. In addition to the agency’s mishandling of contracts for meals and electricity following Hurricane Maria’s devastating blow to Puerto Rico, the Homeland Security inspector general found that Long spent $151,000 in taxpayer funds to pay for personal travel. In September 2018, he agreed to reimburse the government for misused funds. “Rest assured, FEMA is prepared to continue to lead current recovery efforts, to respond to new disasters, and to get ready for this year’s hurricane season,” Nielsen said.